PETRONAS, short for Petroliam Nasional Bhd, is Malaysia's national petroleum corporation incorporated on 17 August 1974. Wholly-owned by the Government, the corporation is vested with the entire oil and gas resources in Malaysia and entrusted with the responsibility of developing and adding value to these resources. PETRONAS has since its inception grown into a fully integrated oil and gas entity engaged in a broad spectrum of petroleum and related value-adding business activities in both the upstream and downstream sectors. Today, with over 100 subsidiaries and associated companies, the PETRONAS Group operates in 25 countries around the world and is ranked among the Fortune Global 500 companies. 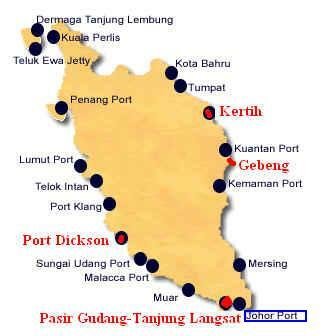 In Malaysia, PETRONAS' petrochemical activities are concentrated along the Eastern Corridor of Peninsular Malaysia within the Kertih Integrated Petrochemical Complex and the Gebeng Integrated Petrochemical Complex. While the production of certain basic petrochemicals has been phased in since the mid 1980s, PETRONAS has more recently embarked on large scale petrochemical projects with multinational joint venture partners. In undertaking such projects, PETRONAS seeks joint venture partners that possess the appropriate technology, financing capability, and marketing and distribution expertise. BASF Petronas Chemicals Sdn Bhd, a Malaysian-German joint venture, expects its butanediol facility in Gebeng, Pahang, to begin operations in the first quarter of this year. A BASF Petronas Chemical official said the butanediol facility, comprising two plants, will produce 100,000 tonnes of butanediol, tetrahydrofurane and g-butyrolactore every year. Malaysia's Petlin Sdn Bhd is producing polyethylene steadily and has finally started commercial sales, a source close to the company said Wednesday. Its 255,000 mt/yr low density PE plant at Kertih was supposed to have started commercial shipments in January this year but was delayed numerous times due to multiple severe mechanical problems. The Malaysian Industrial Development Authority (Mida) is keen to attract investments in butadiene derivatives to produce more synthetic rubber, according to industry sources. The only synthetic rubber producer in Malaysia is Synthomer, based in Kluang, Johor, which started producing synthetic latex last year. Titan considered building a butadiene extraction unit in 2000 as part of a broader plan to invest in value-added projects, although the project failed to materialise. Had the project moved forward, Titan would have supplied butadiene to Taiwan Synthetic Rubber Co (TSRC), which had received Mida's approval for an SBR project. PETROLIAM Nasional Bhd (Petronas) will be investing over RM1 billion to more than triple its methanol producing capacity in Labuan, in anticipation of stronger global demand as well as the coming onstream of new gas fields. A new plant capable of producing 1.7 million tonnes of methanol a year, or about 5,000 tonnes a day, is being planned to begin operations by the end of 2007. Sources said the plant, which is expected to cost over US$300 million (US$1 = RM3.80), will be located adjacent to an existing one that has an annual methanol producing capacity of 660,000 tonnes a year. Feedstock of about 150 million standard cu ft per day of gas will be supplied from gas fields offshore Sabah. Malaysia's Petronas expects to produce on specification grade methanol from its new $1.7 million plant in Labuan from mid-October, a source close to the company said Friday (9/12). Malaysia's Titan Chemicals expects the building of its butadiene plant in Johor to reach mechanical completion in late November, with test runs to begin in December, a source close to the company said Thursday. The 100,000 mt/year butadiene plant at Pasir Gudang, Johor, is being built by Taiwanese engineering and construction firm CTCI Overseas Corporation Limited. Malaysian PET and polyester producer Hualon Corp, which was acquired by India's Reliance Industries late last year, has been renamed Recron (Malaysia), company sources said Monday. Hualon, or Recron, is to become a wholly owned subsidiary of Reliance. A source said Reliance had taken control of certain areas of operations while others were in progress. The Malaysian company has the capacity to produce 500,000 mt/year of polyester and blended yarns, 30,000 mt/year of nylon, 150,000 mt/year of PET bottle grade chips and 450 million yards of fabric at Nilai and Malacca. The company was placed in receivership 破産管財人の管理下 in November 2006, and its assets were offered for sale in June 2007. Hualon emerges as a prominent world leader with its manufacturing locations in Malaysia, Taiwan, Vietnam, Czech Republic and mainland China. Through constant improvement in our production facilities, quality has become Hualonfs foremost competitive edge in the industry. Hualon Corporation (M) Sdn Bhd is indisputably a leader in the integrated textile industry both domestically and internationally. Established in 1989, we started with a paid-up capital of 39 million ringgit. In merely 6 years, our paid-up capital rose to an incredible 858 million ringgit in 1998. Following the official opening of our Melaka plant, we set a significant milestone for Malaysia in the global textile industry. In the short span of 6 years, we established over 28 plants across 200 acres in Nilai and Melaka. And not surprisingly we reached an amazing turnover of 2.1 billion ringgit in 1998. To maintain our products' quality and durability, we have invested in highly automated plants, cutting edge technology and the most advanced machinery. It is therefore no surprise that we've become a trusted name in the integrated textile industry with our products distributed the world over. Besides being a key player in the textile industry, we are also proving great success in PET chips production. Today, we have become one of the leading producers of Chips in Asia. On 3 December 2005, Oriental Daily in Malaysia reported that Hualon's Chairman in Taiwan has been declare bankrupt by court of Taiwan. Hualon's major shareholder is Hualon Corp Taiwan, which was delisted from the Taiwan Stock Exchange in January 2005. The Receivers and Managers of Hualon Corporation (M) Sdn Bhd have invited interested parties, both local and foreign, to submit offers to acquire the operating business and assets of financially-troubled Hualon. The offers should reach the Receivers and Managers, Ernst and Young, by August 3, 2007, Hualon said in a statement today. The textile manufacturer owns and operates a fully integrated production facility in Malaysia. Hualon chalks up an average turnover of US$800 million annually. Hualon said the Receivers and Managers from Ernst and Young have continued to run the operations of the company with the support of the employees, the local utility providers, local and worldwide customers and suppliers. The Receivers and Managers -- Lim Tian Huat, Adam Primus Abdullah and Stephen Duar, were appointed on November 30, 2006. Hualon employs over 7000 employees. The production facility, which includes more than 20 plants spread over 78.7 hectares, is located within industrial estates in the southern states of Negeri Sembilan and Melaka. Hualon has a combined production capacity of over 500,000 metric tonnes (MT) of polyester and blended yarns, 30,000 MT of nylon, 150,000 MT of PET bottle grade chips and between 400 - 500 million yards of fabrics annually. Hualon is predominantly export oriented with sales to Bangladesh, China, Egypt, Hong Kong, India, Iran, South Korea, Syria, Turkey and Vietnam. Reliance Industries Ltd., the world’s largest producer of yarn used for making textiles, agreed to buy assets of Malaysia’s bankrupt Hualon Corp. to expand capacity by 25 percent. The purchase will help Reliance increase its polyester- making capacity to 2.5 million metric tons and increase revenue by $1 billion, the Mumbai-based company said in an emailed statement today. Reliance will control 7 percent share of the world’s polyester yarn and fiber market, the company said. Reliance Industries, owner of the world’s third-largest refinery, and Rohm & Haas Co. on March 22 said they plan to build a plant in India to make chemicals used in paints and plastics as demand rises because of a construction boom. The Philadelphia-based Rohm & Haas, the world’s biggest producer of acrylic monomers for paints and plastics, may build a 200,000 ton-a-year plant at Jamnagar in western India. Reliance’s refinery is based in Jamnagar. BASF and PETRONAS today signed a Memorandum of Understanding to undertake a joint feasibility study to produce specialty chemicals in Malaysia, a move that would extend the two parties’ existing business collaboration in the country. The partners are considering a potential joint investment sum of approximately MYR 4.0 billion / Eur 1.0 billion. Under the terms of the MoU, the two parties will evaluate the technical, commercial and economic viability of jointly owning and operating world-scale facilities for the production of specialty chemicals including non-ionic surfactants非イオン性界面活性剤, methanesulfonic acidメタンスルホン酸, iso-nonanolイソノナノール as well as other C4-based specialty chemical products. The final scope of the investments will be determined following the outcome of the joint feasibility study which is targeted to be completed in 2011. The MoU was signed at the PETRONAS headquarters in Kuala Lumpur. Signing on behalf of PETRONAS were Datuk Wan Zulkiflee Wan Ariffin, Executive Vice President of Downstream Business, and Encik Kamaruddin Zakaria, Vice President of Downstream Operations. Dr. Martin Brudermuller, member of the Board of Executive Directors of BASF SE, responsible for Asia Pacific, and Ms. Saori Dubourg, President, Asia Pacific, BASF, signed on behalf of BASF. Dr. Martin Brudermuller said, "With the rapid growth of chemical markets in Asia Pacific, we are further expanding our specialty chemical business. Our joint venture with PETRONAS, based on a long-standing and successful partnership, is an excellent, well-established and competitive production platform in Asia. By expanding our local production base in Malaysia, we can further improve our ability to supply our customers in Asia, from Asia." According to its Asia Pacific Strategy 2020, BASF intends to produce 70% of Asia Pacific sales in the region, with investments of ? 2.0 billion between 2009 and 2013. The proposed move by PETRONAS and BASF will build on their successful strategic partnership in the country, established in 1997. The partnership, via BASF PETRONAS Chemicals Sdn Bhd (of which BASF owns 60% shares) , currently own and operate an integrated complex in Gebeng, Pahang, Kuantan that produces acrylic monomers, oxo products and butanediol. As for the subsequent phase of the collaboration, PETRONAS Chemicals Group and BASF will jointly evaluate the outcome of the joint feasibility study and will adopt it as part of their strategic growth plans, if technically and commercially viable. PETRONAS is a Global Fortune 500 company wholly owned by the Government of Malaysia, principally involved in all spectrum of integrated oil, gas and petrochemical industries. For the year ended 31 March 2010, PETRONAS recorded a group revenue of US$62.5 billion. More information on PETRONAS is available on www.petronas.com. BASF and PETRONAS announced today that the Heads of Agreement (HoA) between the two parties for a joint speciality chemicals venture within PETRONAS’ Refinery & Petrochemical Integrated Development (RAPID) project in Pengerang, Johor, has been terminated by mutual agreement. The HoA was signed on March 5, 2012, for a proposed partnership to jointly own, develop, construct and operate production facilities for a host of specialty chemical products in RAPID. Following negotiations, PETRONAS and BASF concluded that it would be in their mutual interest to terminate the HoA as both parties were unable to come to an agreement on the terms and conditions for the implementation of the proposed venture. Notwithstanding this decision, both PETRONAS and BASF are committed to continuing their existing long-term partnership at BASF PETRONAS Chemicals in Gebeng Industrial Zone, Kuantan, Pahang. PETRONAS and Evonik Industries AG have signed a Letter of Intent (LOI) to jointly embark on the development of production facilities of specialty chemicals within PETRONAS’ Refinery & Petrochemical Integrated Development (RAPID) project in Pengerang, Johor. The plants are expected to have the capacity to produce 250,000 metric tons of hydrogen peroxide, 220,000 metric tons of isononanol (INA) and 110,000 metric tons of 1-butene annually. The hydrogen peroxide will be used on site to produce propylene oxide by the licensed, eco-friendly HPPO process Evonik had jointly developed with ThyssenKrupp Uhde. These projects are expected to come on stream in 2016.